Brooklyn Bedding—manufacturer, retailer and pioneer of the online mattress—announced the launch of a niche sleep solution today, custom crafted for sleepers who can never find a mattress firm enough. 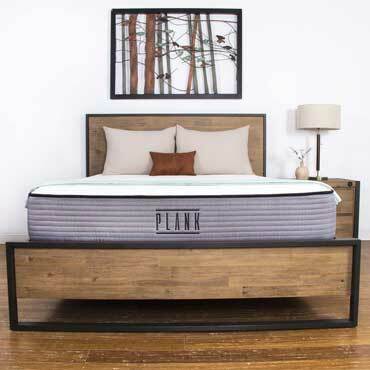 Available online only,the Plank by Brooklyn Bedding offers two unique sleep surfaces in a flippable mattress with both standard firm and extra firm sides. "An excessively firm mattress isn't for everyone," said John Merwin, Owner and Chief Marketing Officer of Brooklyn Bedding, "but that's the advantage of owning our own factory. We can develop very personalized sleep solutions for virtually any sleep challenge. The Plank by Brooklyn Bedding is our response to customers who persistently told us they would like a sleep surface practically as hard as the floor. Every mattress on the market they had previously tried had too much give or conformability." Personal preference, sleep position and health considerations are all key factors for sleepers looking for an extra firm mattress. Firm mattresses are engineered to help reduce pressure on the circulatory system and encourage sleepers to inhale more oxygen as they snooze—considerations that can be extremely important to back sleepers. For others, sleeping on a flatter, firmer surface simply creates a neutral spine position that's better for the back and posture overall. Culture can also play a key role: the design of the Plank by Brooklyn Bedding was inspired by the minimalist approach to sleep in the Far East. To better accommodate all considerations, Brooklyn Bedding created a dual comfort design: the top side of the mattress is standard firm with minimal loft; the bottom side is ultra-firm with zero loft, allowing sleepers to choose a "just right" firmness level. "The Plank by Brooklyn Bedding made its debut to a limited retail audience at the Las Vegas Market last year," said Merwin. "The positive reaction confirmed to us the need for a niche solution which struck the delicate balance between the firmest sleep surface on the market, and an ergonomically sound sleep experience. Based on the current reviews of the product, we feel we've been able to deliver on that objective for our customers." The Plank by Brooklyn Bedding retails online between $699 for a twin to $1,249 for a California King. Like all Brooklyn Bedding mattresses, it comes with a free 120-night comfort trial and a 10-year warranty. The company also offers free nationwide shipping with bed-in-a-box delivery.